Shopify is, undoubtedly, one of most popular, rapidly growing eCommerce platforms. It empowers 500,000 businesses in 175 countries around the world (source: Shopify press releases dated August 1). 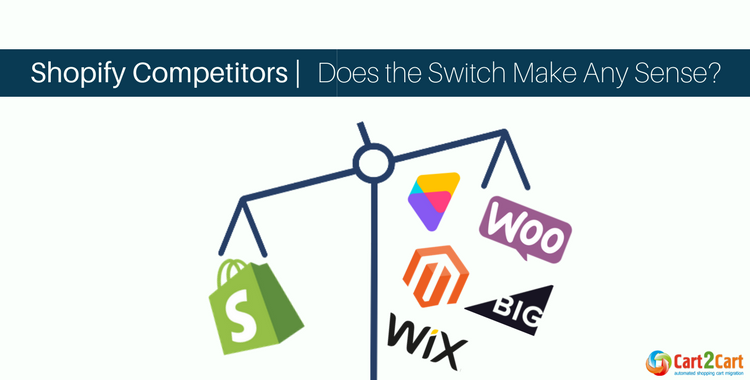 Due to the fact, though, that eCommerce industry is saturated with many effective solutions, merchants reconsider the effectiveness of Shopify and try to evaluate the beneficial features of its competitors. It is worth mentioning that Shopify is highly-optimized hosted solution. Its set of tools is easily compatible with features of open source platforms e.g. WooCommerce or Magento. Some of Shopify alternatives are also hosted and trying to match Shopify in functionality, I mean BigCommerce, Volusion and Wix here. Let’s go into detail and define their differences to find out which one you should give a try. Since time of its creation BigCommerce is the fiercest Shopify competitor. It is an acknowledged eCommerce platform, both easy to comprehend and build eCommerce store from scratch without technical skills or coding expertise. Choice between Shopify and BigCommerce is confusing issue. Both solutions are hosted, easy to use, feature-rich, highly-optimized with omnichannel 24/7 support. Offering wide range of eCommerce tools (inventory management, products showcase, setting taxes and rates, tracking orders etc. ), Shopify and BigCommerce represent respectable shopping carts. Nobody would argue that both platforms allow to build attractive and advanced e-store. But there is always a slight difference, isn’t there? If you are in search of Shopify alternative that has more out-of-the-box eCommerce tools - BigCommerce is good option! Shopify kindly provides you with basic eCommerce tools to create and run e-store. Meanwhile more advanced means to grow your profit and build effective eCommerce store are available in the official app store at additional price (all of them have free trial period). The largest Shopify competitor is tend to give you most comprehensive set of eCommerce features among leading shopping carts out-of-the-box, they are already included in a monthly fee. Now you must be thinking that you’re going to pay more to get this rich set of tools, let me dispel the myth. Here is the monthly price comparison of BigCommerce and Shopify. If this is not convincing enough to make decision - I have one more argument. Let's consider transaction fees. If you are using Shopify payment gateways you’ll not pay a cent, but if you use third-party payment methods (PayPal, Square, Authorize.net etc.) you’ll be charged up to 2% depending on your plan. In its turn, BigCommerce allows to use third-party solutions without fees. So if you’re willing to get more value from advanced tools and get freedom from transaction fees you can opt your current Shopify store to BigCommerce automatically without manual data input. This can't be just a coincidence, surely. If you want to dive deeper into investigating differences between these shopping carts (and the one we'll going to review next), check out our comprehensive Volusion vs Shopify vs BigCommerce review. 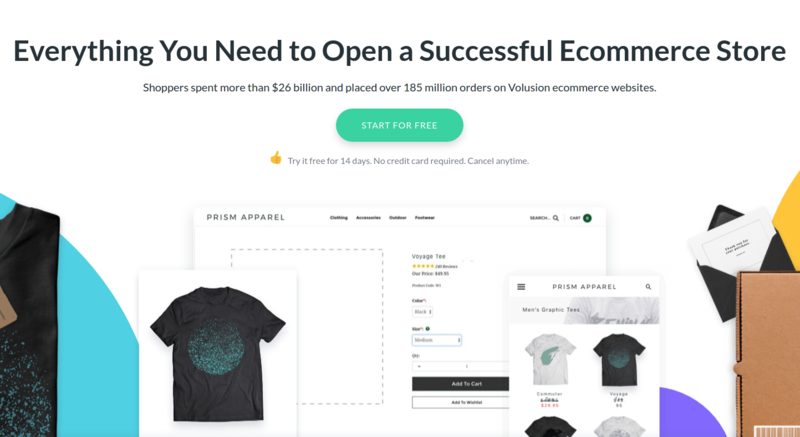 Volusion is another hosted Shopify competitor. It offers intuitive and well-organized system and around 900 out-of-the-box features that helped merchants to earn more than $26 billion on sales (according to Volusion official statistics). 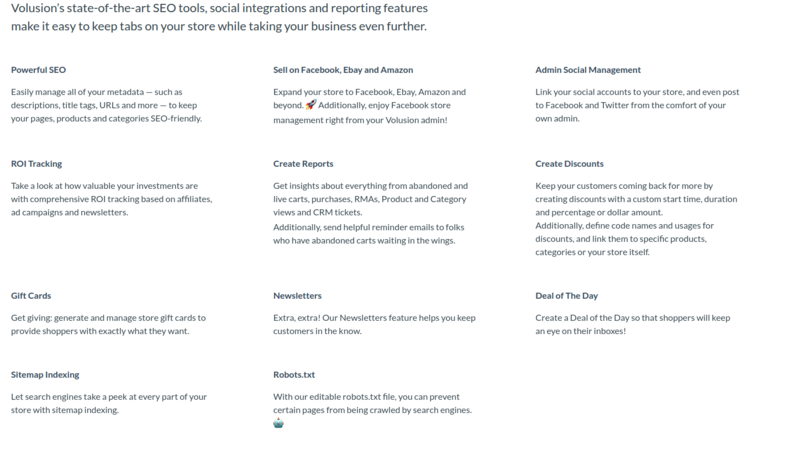 The same as Shopify, Volusion allows you to create Facebook store and sell on eBay and Amazon. These integrations along with set of effective marketing tools and SEO-optimization make Volusion one of the equal competitors of Shopify. Here's the list of key eCommerce features Volusion points out on its website. Volusion is cheaper than Shopify and the lowest-price plan starts from $15 per month and vary to $135. However, within Mini plan you’re able to sell only up to 100 products. The absence of transaction fees at Volusion is one more point worth emphasizing while comparing Volusion and Shopify platforms. Both Shopify and Volusion are mostly popular in the United States. But according to buitwith.com stats Shopify runs 6 times more stores than Volusion. This shows that, even being one of Shopify competitors in functionality, Volusion is far away from beating its popularity - Shopify is nevertheless leading! Among competitors of Shopify I want to mention Wix website builder. It could become a good choice to those merchants who prefer ease of use to advanced eCommerce tools. Wix was primarily created to build and maintain professionally-appearing websites, thus its eCommerce functionality looks quite limited comparing to “pure” online store builder - Shopify. Wix’s famous drag-and-drop interface makes it a perfect match to non-tech users. It is mostly used by creative minds - those who know how to create jewelry, design cloth, take pictures etc. and want to avoid hosting headaches. 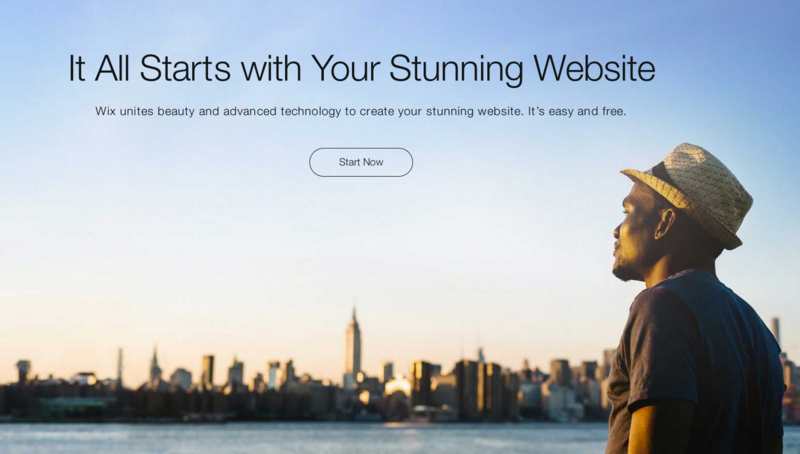 Just in few clicks you can create a beautiful website. To launch eCommerce store, you should download any of apps available on marketplace that will enable you to sell 100-500 items without coding skills. It just couldn't be simpler, right? Wix is one of Shopify alternatives in design-wise that provides you with extremely attractive templates and easy-to-use image editor. By the way, Wix the same as Shopify offers extensive blogging possibilities. Experienced merchants and marketers know its value on today's market - effective blog is a key to increase customer engagement and Google visibility. 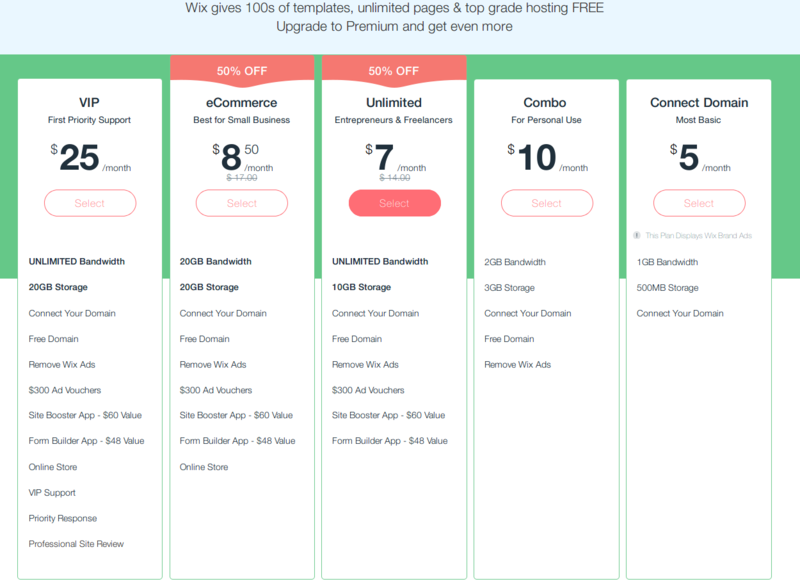 As for the pricing, I bet you’ll never find cheaper hosted solution than Wix. The lowest plan that allows you to set up online store costs $8,5 per month. It’s not a joke. 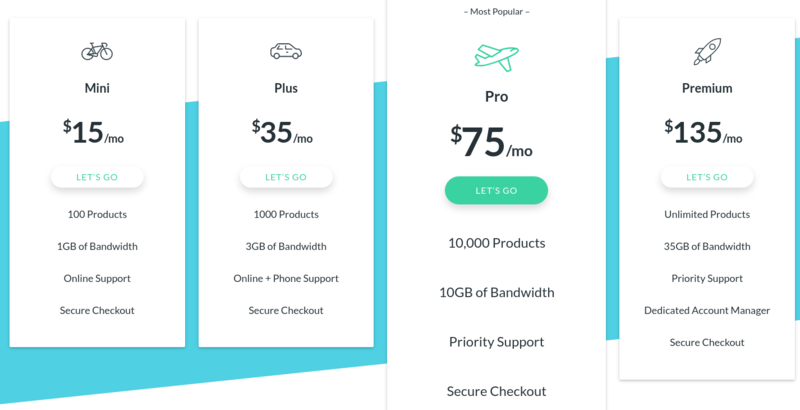 The difference in pricing plans of Wix and Shopify is more than noticeable -Basic Shopify is more expensive than Wix VIP. But, I can’t neglect the fact that cheapest Shopify monthly plan gives you more advanced and effective tools than the highest Wix. 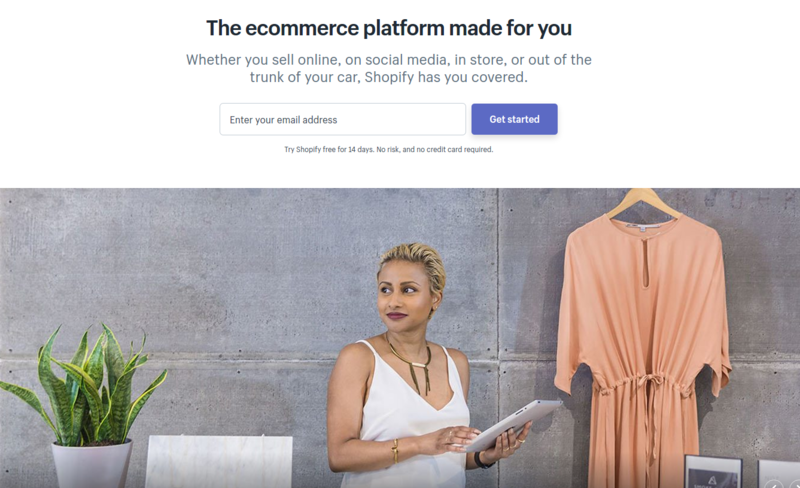 Within the list of Shopify competitors, Wix eCommerce features are pretty limited, but entrepreneurs will enjoy user-friendliness and efficient marketing tools. In addition, users will surely appreciate absence of commission making transactions. The choice is always yours, but if this website builder is too weak for your needs and goals you can always change Wix to Shopify - you won’t regret! (but I didn’t tell you that!). WooCommerce is the first in our list open-source Shopify competitor. This robust platform is an eCommerce plugin for WordPress - the easiest and most powerful website and blogging content management system nowadays. 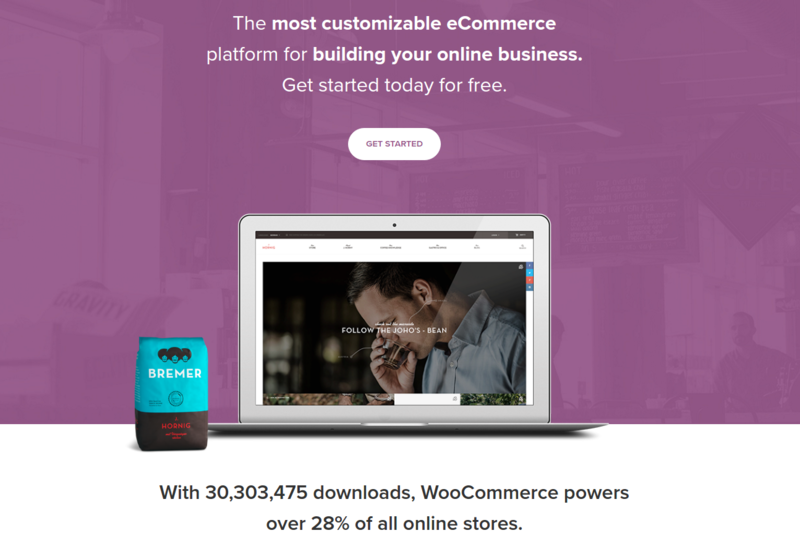 WooCommerce stated on their website that they are powering 28% of all world online store. That’s impressive, isn’t it? WooCommerce is a good option for fast-growing startups as it is highly-optimized, lightweight and full of advanced features. Open code allows you to change your store background as much you want and constant upgrading enriches your platform with new features able to get quickly to your target audience. WooCommerce is robust enough to power extremely large web stores in the world. It allows you to sell anything you want from digital to physical products. Being open-source WooCommerce requires some technical skills (optionally you can hire a developer) to build a website and cover tech aspects. You will be responsible for website performance, technical maintenance and hosting, unlike in Shopify. There is nothing to complain about WooCommerce, it is user-friendly, just a bit more challenging than Shopify. You may ask what makes WooCommerce strong Shopify competitor? No doubts that it is freedom of use and unlimited flexibility. And of course, running on WordPress, WooCommerce can be turned into anything you want with your wish and knowledge. WooCommerce has a significant advantage over Shopify talking about design customization possibilities. You are able to edit much more than allowed with Shopify due to its hosted nature and the total amount of themes in WooCommerce extends Shopify’s a lot. Along with WooCommerce native templates, you can apply any of WordPress to your store. There are tons of them in the web. WooCommerce can give you lots of opportunities to profit from your venture. Ready to such a challenge? There is always possibility to switch your Shopify store to WooCommerce if that is what you need or vice versa, we don't mind! Magento - known to be most flexible eCommerce platform in the world just can’t be excluded from the list of top competitors to Shopify. 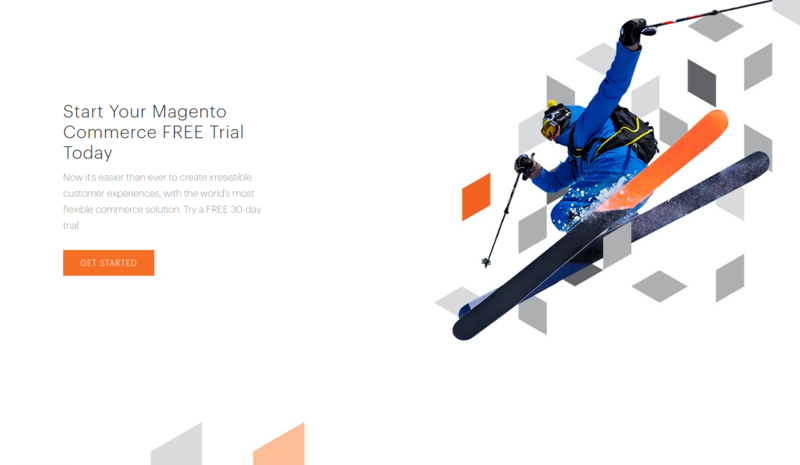 The same to WooCommerce Magento is open source solution that offers unlimited possibilities to tech-savvy merchants. Magento comes with well-organized interface and professional look. It offers all of existing eCommerce features and is able to build perfect e-store. Open code provides you with high-level customization possibilities. Though unlike Shopify, Magento is not so user-friendly and you’re likely to face tons of challenges without technical background. You are about to face tons of challenges if you have no prior experience in web development. Anyway, you can always hire a developer to create you a good-looking store. Apparently, it’s not the best alternative if you have limited tech skills, but if you feel it’s what you need - get prepared to spend days learning the basics of Magento. Magento is a powerful Shopify competitor, but I think Shopify gets the winning point allowing to build profitable eCommerce store with maximum ease and effective tools. If I was to choose, I’d rather pick Shopify (or migrate from Magento to Shopify). To my mind, Shopify can cover all the basic eCommerce needs your Magento store would with much, much less headache. I can't deny though that whereas Shopify does have certain limits, Magento sees no barriers in its tech-wise excellence. But it's too challenging for average store owner. Good news! We’re done for today. I think you have got enough options to think over and decide what shopping platform to choose. Choosing the right platform may be confusing, but there is always a possibility to move your store’s data to another solution if you are not satisfied with what you have. If this situation is familiar to you, Cart2Cart automated migration tool can help you. It supports more than 80 eCommerce solutions, and I’m sure you’ll find yours. Cart2Cart allows you to migrate to Shopify from any of them or switch from Shopify wherever you want. What is good about such service is that it doesn’t require technical skills, your data will be automatically moved to a new store in few hours. Another good reason to try it is 24/7 support and free trial - no losses if you’re not satisfied with the result. If you still haven’t tried out the market leader, don’t miss a chance to check how your Shopify store may look - Shopify 14-day trial. If you are ready to give your store brand new look and open new horizons of eCommerce with effective tools start running Free Demo now! Enjoy.